This movie had better win some awards!! Avoid. You will regret it. If not, then something is seriously wrong with you. Seriously. Predictable - paint by numbers but the painter is beyond drunk AND stoned. Jaws 3 in 3D more clever, engaging. Badly scripted - "F" bomb dropped continuously, as a noun, verb, adjective, adverb - often all 4 in same breath. Come on Holywood, who talks like this? 10th grade drop outs in the oil patch? Not even close! Unbelievable. Boring - first 30 min was as good as it got because it was still only predictable and nadly scripted. Then it got real boring. I found myself checking my watch every 5 to 10 minutes. When would it end?Several up and left mid-way. I stuck it out. My loss. excellent film. all those bitching about the language. you might want to get out more. as awful as it is, the f word is everywhere all the time. I don't like it, but that's reality. Great movie, great chemistry, great acting and great music.... a possible Oscar winner. Overall I really enjoyed the movie WITH the exception of all the swearing; hence the loss of one star. Great music and great chemistry between Gaga and Cooper. Can’t wait for the DVD to become available—- enough with keeping it in the theatres already!!! Great movie. Bigger Lady Gaga fan than ever. The worst musical of the year. 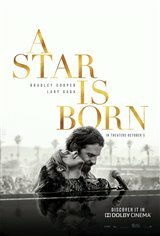 Loved the entire movie - Lady Gaga is honest and real and Bradley Cooper is yummy. Music is wonderful. I've seen it 3 times and can't wait to own a DVD. Disgusting language did they forget how to speak decent English or how to write a script. Excellent movie, well done in every way! Best movie EVER. Great soundtrack! Should have called it A Star Is Boring. I loved this very realistic movie. Gaga and Cooper were both superb and did justice to the movie. Hope Gaga wins an academy award....she is terribly talented (and so is Cooper). We need more movies with real human feelings. I really can't say enough good things about this movie. The music, Bradley, Gaga...unreal!! AMAZING MOVIE!! BRADLEY COOPER AS JACKSON TOUCHES YOUR VERY SOUL...BEST MOVIE I"VE SEEN FOR A VERY LONG TIME!!! I liked everything about this movie !!! Best movie in a decade. Enjoyed every second. Just totally awesome. If you like Bradley Cooper, stay away from this one. You'll lose respect. Good lord. Has Hollywood no more ideas? I've seen four variations of this movie already. It's this year's Grease 2. I loved everything about it! I've seen it 4 times and could keep going back. Amazing movie! I saw “A Star is Born” a few weeks ago and I can’t get this movie out of my head. Lady Gaga and Bradley Cooper are phenomenal together. It is so well done; the story is just brutally authentic, and the music is incredible. This is a must see movie! Even Mama Mia had better music! Loved the movie, both Gaga and Copper where amazing and real!!! A film with genuine great voices. Loved the acting, Cooper, you Wowed! Cooper has evolved as an actor! Loved the music! Loved the story. L.G. you sing with extreme passion! Love it! I would pay to see this movie again in the theater. I will definitely buy on DVD/BluRay. I loved this movie. Great chemistry between the cast. Liked this remake better than the Streisand -Kristofferson remake and I liked that one too. Horrendous soundtrack made me appreciate the Telly Savalas cover of "You've Lost That Lovin' Feelin'" in a whole new light. A good movie worth seeing with good acting.